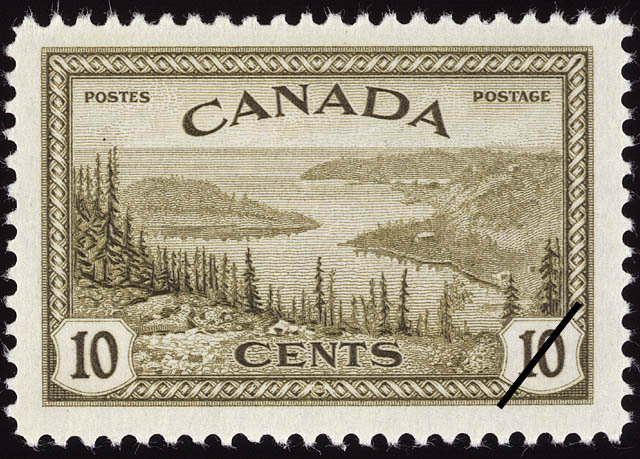 The value of a Great Bear Lake - 10 cents 1946 stamp depends on several factors such as quality and wear, supply and demand, rarity, finish and more. Values in the section are based on the market, trends, auctions and recognized books, publications and catalogs. This section also includes information on errors and varieties and characteristics. With the exception of the war issues of 1942 and 1943 and certain special commemorative stamps, all pictorial postage stamps issued between 1927 and 1945 have illustrated subjects relating to Canada's history, geography, agriculture, and natural resources. The end of the war provided desirable opportunity to use subjects emphasizing the new industrial importance of Canada. In 1946, the Department decided to replace Canada's wartime pictorial postage stamps with an issue intended to provide a pictorial survey of Canada's primary industries and raw materials. The issue placed emphasis on the reconversion of Canadian industry to a peacetime basis. On this stamp, a view of Great Bear Lake, Northwest Territories, showing the point where prospectors discovered pitchblende deposits, the source of radium and uranium, a Canadian contribution to science through her mining industry.